So Mythic gets shuttered in July, does not exist, closed, gone. Yet here we are. 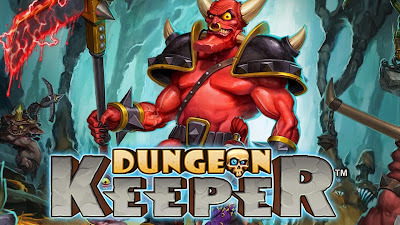 dungeon Keeper Mobile got a new update that adds a lot, changes a few things, and leaves me fumbling about trying to adjust. Is it good? Bad? I personally like it in spite of finding my usual methods not working. It used to be, since January if not earlier, you click on a spell and the screen was locked til the time to cast was over. This was bad because you could accidentally click on a spell and not only is mana wasted but you're unable to see what else is going on. Now no matter the spell you can click on it then swipe around the whole dungeon. Here's a breakdown of what each spell is like now. Cluck Off: Now you get a number of clicks per cast and can be patient to find the exact minions you want to use it on. Bomb Wall: Like with cluck off you get a number of clicks per spell. Each click drops a bomb that does single tile damage, but you get several bombs per cast, so while you no longer can blow open a huge hole you can bomb open passages throughout your target's dungeon. Dragon Breath: You start with a full meter when the spell is cast and each swipe drains that meter, but you can two finger swipe to move around so you can use it on the minions you want to burn. It really is an antipersonnel spell and while it can do damage against rooms, it isn't that spectacular. Lightning: You can still only use it on three rooms, but you can take time to pick which rooms. Now the big thing is it disables a self defending room's defenses temporarily, which to me makes it a far more useful spell than it was. Now in addition to campaign missions either attacking or defending against CPU opponents there are a series of unlockable challenges that give you a set army and spells to beat. These challenges are pass/fail with the win condition being to get rid of the enemy dungeon heart however you like. These serve as tutorial for specific mechanics and let's you see how different things work. Personally I would like to be able to replay each even if there's no reward, but that's just me. While relatively minor its nice to have things like the guild and replay buttons on the primary screen rather than poke around. There are a few new achievements to deal with the fact the guard post levels. The order of being able to get rooms is changed. The dungeon heart now costs combat points to upgrade, and other things. Is it good?I think some o these things were badly needed seeing as the community cried for several changes since January. Yet when those changes went live just as many complained about the changes once made. I personally am glad because it breaths life into the game.